FileMenu Tools is a awesome application which adds more flexibility to your right-click menu in the Windows Explorer. It offers full management to users who install this application and allows you to add and remove tasks and tools to the right-click menu. 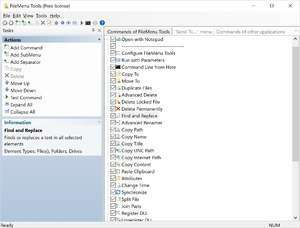 It can also add cmd.exe commands to the menu, which gives power-users the ability to run tasks and scripts on a variety of different files. For security reasons, you should also check out the FileMenu Tools download at LO4D.com which includes virus and malware tests. Additional screenshots of this application download may be available, too. FileMenu Tools has a presence on social networks.